Inigo is all about sushi handrolls, offering a new twist in sushi and lunchtime eating. Drawing inspiration from both Japan and Australia the small team’s new Head Chef (ex French Laundry, Hix, Gavroche) has devised a menu inspired by European and Pan-Asian flavours. Inigo uses ingredients from H. Forman & Son and has an ethical approach to packaging, food waste and staff pay. 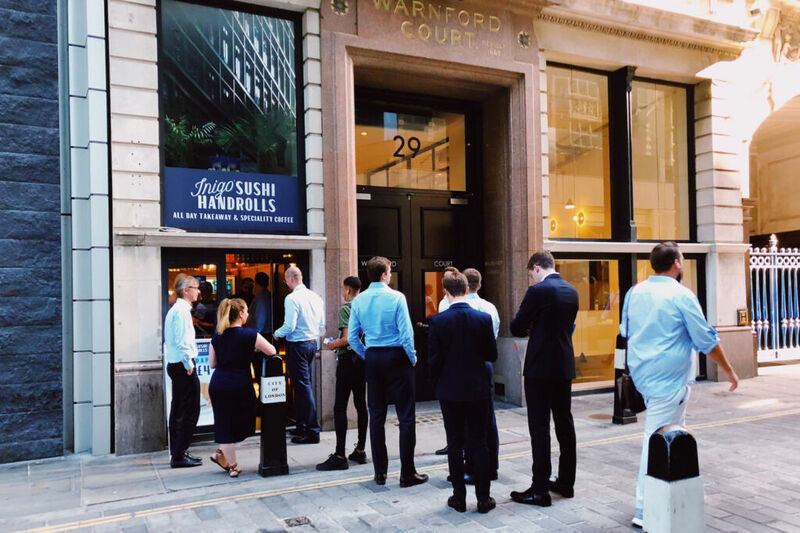 After finding their feet with a Soho pop up in 2017, Inigo’s new permanent home in the City has now opened for business alongside Deliveroo orders and catering to offices and events across town. Aussie Jeremy Bliss wanted to be the first to bring classic Australian-style, large format handrolls to London. For his City outpost, Jeremy has enlisted the help of Chef Terry Edwards who is fresh from working in Michelin-starred kitchens in Europe and America. Open from breakfast until late afternoon, Inigo serves up portable and healthy sushi; served up fast, at a competitive price. The handrolls are complemented by a flavoursome set of salads and miso soup, as well as sweet snacks. The quality of Inigo’s ingredients is surprisingly high compared to other fast service eateries in London, with family-run H. Forman & Sons supplying their fresh fish and meat. Keeping good company, H. Forman supply to the finest restaurants and institutions including Gordon Ramsay, Marco Pierre White, Fortnum & Mason, The Dorchester and The House of Lords. Menu classics include Salmon Avo and Spicy Tuna (Inigo-fied with a Ponzu marinade, Baby Gem Lettuce, Pickled Daikon & Spicy Mayo); those looking for a meaty fix can opt for Peking Duck or Teriyaki Beef with pickled Shitake Mushrooms. Vegans and veggies won’t be disappointed, there’s the spicy Red Hot Pepper roll and the Miso Broccoli roll, featuring tender stem broccoli, cucumber, pickled daikon and punchy black sesame miso. Fresh and zesty salads complete the offering, there’s Spicy Mangetout and Grapefruit, Smashed Cucumbers or specials such as quenching Watermelon Salad. Inigo fans know to keep an eye on social media to plan out their lunch break, with specials published every week; mouthwatering pictures are posted of inventive dishes such as Roasted Pork Belly, Pickled Fennel, Pickled Carrot & Sriracha; Rare Sirloin Steak, Steamed Carrot, Edamame Beans, Horseradish & Yuzu Mayo and Panko Fried Chicken, Sweet and Sour Sauce, Pickled Pineapple & Steamed Carrot. For pud, Inigo proffers vegan Chocolate Bites, Yuzu Possets and Chocolate Mousse, made with cacao, avocado & chilli. Breakfast comes courtesy of St John baked goods and steaming hot Caravan coffee, alongside dairy and coconut yoghurt, cereal and granola bowls as well as warming porridge with assorted toppings. Portable and individually packaged handrolls and maki boxes make ideal fodder for corporate catering, whether in canteens or as deliveries for meetings and events. As a nominated supplier to Baxter Storey, one of the largest corporate caterers in the UK, Inigo currently supply Amazon, Channel 4, Visa, UBS and Standard Chartered Bank from their specialised kitchen, based at H. Forman & Sons. Inigo is open Monday to Friday from 7:00AM to 17:30PM at 29 Throgmorton St, London, EC2N 2AT and can deliver to your meeting room table or event with Corporate Deliveries or to your home or desk via Deliveroo and City Pantry.